Aleksandr Kerensky left the Inner Sphere with approximately 80 percent of the Star League Armed Forces. break some of the diplomatic gridlock that paralyzed it for so long, keeping it from being an effective and unified force. movement could raise enough support to overthrow Marik rule. the Internal Emergency Act of 3030 stripping the League's member states of most of their sovereignty for the duration of the emergency. 288, the Act empowered the Captain-General to decide what constituted a crisis and when it had passed. ComStar's station on Son Hoa. provinces, but mere cultural regions. especially dismayed to see its influence over Thomas waning. Then came the news that Janos Marik had recovered enough to resume control of the League. escaped death after being called from the room on an urgent matter just minutes before the blast. but Paul supported his younger brother. glorious conquest soon became mired in a series of costly battles with no clear winner. ComStar medical center on Terra, where he recuperated for a year. over Thomas so that he would be their pawn after returning to power on Atreus. Parliament's hatred, too, when he refused to give even the pretext of consulting them on major issues. an ambitious, but ill-planned, offensive. the Marik family. The Addendum also eliminated the Home Defense Acts, which had paralyzed the League military for so long. as a leader, Thomas announced that he was leaving Atreus to lead the League forces. reconciliation, the Captain-General pardoned Andurien political and military leaders for their roles in the civil war. young men and women who want to enter the fast track into government or the military. body to little more than a public forum. Clause 9 also did away with the Home Defense Act. 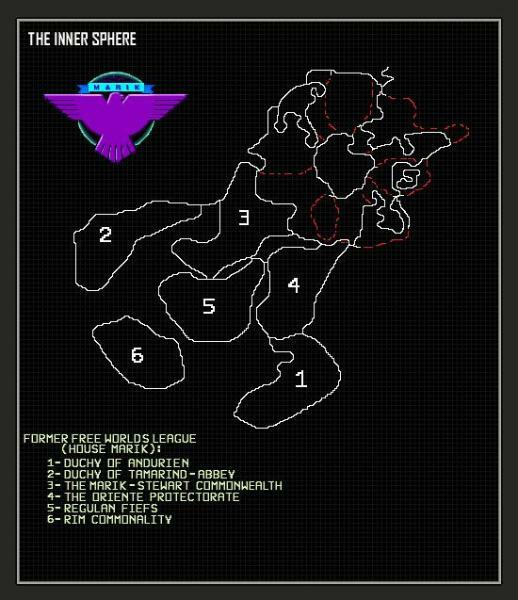 Rasalhague Republic and the Draconis Combine to enable them to better withstand Clan assaults when the offensive resumes. The Free Worlds League also got a boost after the ComStar Schism, when a portion of ComStar broke away, forming the Word of Blake. further hopes of dominating the Captain-General, it is possible that he supports Thomas Marik out of simple admiration for his policies. Cameron-Jones. He has a terminal case of Regulan blood poisoning and is not expected to live much longer. during the war with Andurien. As an MP, his good looks and fiery rhetoric have already won him the position of Opposition Leader. Recognizing the young man's potential, Thomas Marik offered him a high post in government, but Kirc refused the offer. which many League citizens would find abhorrent. opportunity rather than an obstacle. A good example is the dissolution of the provincial borders, which is a boon to League industries. warm-up of relations between those two powers. states, including those of the Periphery. League would be jeopardized by a close relationship with Romano Liao. underway between the two realms. As yet there has been no exchange of ambassadors. successfully by the Federated Suns. The first League Legions were anchored by the elite 'Mech regiments from the existing military, but only after their loyalty was assured. mercenary units in its employ. The new League military has been successful on the field, but certain internal troubles must be cause for the Captain-General's concern. most of the generals of the League military, but as of this writing, there has been no word of acceptance by the Captain-General. realm into a potent and efficient state. Federated Commonwealth will face an enemy alliance equal to our own political, economic, and military power. provinces lost. In time, these people will simply pass from the scene, leaving Thomas's way clear. that would simultaneously punish Steiner-Davion for his treachery and recapture former Marik and Liao worlds. development to settle for a separate peace with Katrina. Commonwealth until regular forces can be shifted to those planets. additional conquest of the Chaos March, though that may change. Marik with ComStar manufacturing techniques that will be used to produce an impressive new line of BattleMechs.